The first-ever “sharing parenthood” of the air force marks a milestone in the creation of a German-Dutch joint military, which began more than 20 years ago, and falls in line with expansion of the all-European common defense system PESCO. Following a path of military cooperation between Germany and the Netherlands, the Hague is taking 450 soldiers from an air force base on German soil close to the Dutch border under its wing. The unit will remain stationed in the German state of Schleswig-Holstein. They are to protect military objects from ground attacks. PARIS/BERLIN (Reuters) – The French government will in June launch a deployable European military crisis force outside of existing European Union efforts, French Defence Ministry sources said on Wednesday. Paris has been in touch with a dozen countries, including Germany, the Netherlands, Britain and Denmark, about the initiative, holding a working group to outline the idea in March. The idea aims to bring together European countries with a military capacity and political desire to collaborate on planning, carry out joint analyses of emerging crises and to react to them quickly. “It would not be within the European Union and would allow countries outside it, like Britain, to be part of it,” said one source. French President Emmanuel Macron broadly outlined the idea to have a rapid European intervention force by the end of the decade during a landmark speech on Europe last September. As long-term readers of this page are aware, I have written for years that Europe would end up with its own military–and that Germany would dominate it. PESCO is a fairly new organization, officially starting in December of 2017. As of March 6, 2018, it has reportedly approved 17 projects for Europe’s military. 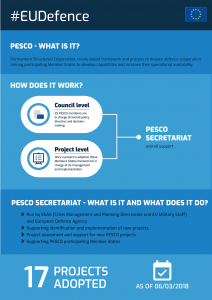 As far as the German-dominated PESCO goes, it has been (correctly) reported that it is about war, not peace (see ‘PESCO is not about peace, it is about preparing for EU wars’). But PESCO will be more than about some small war, what is happening in Europe (whether or not the term PESCO will be used) is going to result in World War III. What nations are these in confederation against God’s people? Here is the answer of this prophecy! Here is what is yet going to take shape in the Middle East! But Germany is not only going to be embroiled in the hot Middle East controversy, she is going to spark World War III! “O Asshur, the rod of Mine anger,” declares God. Here is a prophecy concerning Germany — the descendants of Asshur today! “The staff,” says God, “in their hand is Mine indignation. I will send him against an hypocritical nation (that is, Israel — America and Britain today), and… I will give him a charge to take the spoil, and to take the prey, and to tread them down like the mire of the streets” (Isaiah 10:5-6). Our sins are mounting to heaven itself. And God is going to punish us by the very nation whom we have tried to buy for an ally! It is God who is going to permit the revival of Germany — this time in a gigantic union of 10 European powers united with a great religious power — to punish us in World War III. We won two major wars against Germany in one generation. But the third time God is going to punish us as we have never been punished before! The sword of war is going to strike us “the third time” (Ezekiel 21:14), and we are going to be led away captive to Assyria and to all nations (Isaiah 11:10-12). Germany is to be warned of her sins. Because she will not now repent, God will use her to punish us first. Then He is going to punish her. While his timing was off by many decades, we are seeing German-dominated political (European Union, which will reorganize), economic (Eurozone), and military alliances (PESCO) beginning to rise in Europe. Expect to see church involvement in the future as well. Major changes are happening and most are NOT being covered much by the mainstream press. The “He” is identified as the final prophesied European King of the North in Daniel 11:40 (watch also Can You Prove that the Beast to Come is European?). The Beast of Revelation 13 and the “he” of Daniel 11:39 is a European leader, also called the King of the North. Notice that the strongest military power–which currently is the USA–will be taken over. Europe is looking to arise militarily. And it is now starting to tell the world publicly that it intends to do so. The world will be surprised when conquering by Europe will happen, which is part of why I have long written that European technology will be a key factor in this (as will be deception and problems in the USA). While Europe has been relying on the USA for defense, the time will come when Europe concludes it not only does not need the USA, but that it would prefer to destroy it! The Europeans are mad at the USA for many reasons (including its President Trump), the UK for the Brexit vote, and will decide that places like Canada are too connected to them to remain. The USA and its Anglo-Saxon descended allies will be defeated (Daniel 8:24-25). The Bible teaches that this will come to pass (Daniel 11:39; see also USA in Prophecy: The Strongest Fortresses). We are seeing more and more steps taking place in Europe consistent with that. What Did Christ Mean  Many Are Called, But Few Are Chosen? This article was by Raymond McNair. Forbes’ Brexit Monster is the Beast of Revelation Various ones have been properly convinced that there is a plan for a European superstate. Forbes’ writer Tom Worstall wrote that the Brexit vote was about the United Kingdom “not joining the monster of the European Union to come.” The Bible tells of a Beast monster that will arise in the end times in Europe. Dr. Thiel cites news reports, as well as the Old and New Testaments, to show that the monster many fear will arise in Europe, despite the vote by the British to exit the European Union. This is a video. Brexit and the fate of Northern Ireland, Gibraltar, the UK, and the USA On April 29, 2017, 27 of the nations of the European Union agreed to certain guidelines for the negotiations with the United Kingdom of Great Britain and Northern Ireland which gave its notice to leave on March 29, 2017. These guidelines are contrary to what the UK wants. Does the EU intend the UK to pay a price for leaving the EU? What does Spain want? What does the Republic of Ireland want? Will Northern Ireland and Gibraltar eventually fall under European control? Will the UK and USA be conquered? What does the Bible teach? Dr. Thiel answer these questions and more in this video. Germany in Biblical and Catholic Prophecy Does Assyria in the Bible equate to an end time power inhabiting the area of the old Roman Empire? What does prophecy say Germany will do and what does it say will happen to most of the German people? Here is a link to a video Is the USA Pushing Germany to Start WWIII? Wars, rumors of wars, and the Apocalypse Jesus foretold a time before the end where there would be wars and rumors of wars. The Apocalypse (the Book of Revelation) warns of the red horseman of war. Now, even secular writers, like Larry Edelson, are worried that wars and rumors of war are the most menacing problem that now haunts the earth? Are they right? What is the solution? This is a sermonette-length video. This entry was posted on Friday, April 6th, 2018 at 3:00 pm	and is filed under Prophecy.